The aim of the paper is to stimulate a discussion about the market for CSR practices. This entails a shift of focus from contemporary approaches of analyzing the phenomenon that largely focus on the way in which CSR actions affect businesses and the markets. In contrast, the present paper proposes an analysis of the market for CSR actions and activities as a more integrative approach to conceptualizing the complex nature of the phenomenon. Three critical dimensions are identified as determinants of CSR market outcomes, namely the content of the demand and supply forces, the origin of the market, and the institutional terrain within which the market is developed. A tentative application of the proposed context is discussed with reference to the food sector. 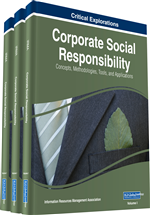 The aim of this contribution is to stimulate a discussion about the market for Corporate Social Responsibility (CSR) practices. This entails a shift of focus from contemporary approaches of analyzing the phenomenon. Indeed, much effort and research has been put on the analysis of the ways in which CSR actions affect the markets. To mention just a few, areas of research range from the management of inter-firm operations, industry competition and the strategic planning of firms, and consumers’ purchasing intentions and behavior, to the regulation of markets, the quality of a country’s institutions and the management of power held by various stakeholders in a society (Walsh et al., 2003; Garriga and Melé, 2004; Kakabadse et al., 2005; Perrini, 2005). While available research has resulted into an important body of knowledge and information regarding some key issues related to the phenomenon, many issues are yet to be understood. One central issue relates to that the CSR field lacks a commonly accepted paradigm despite that major characteristics of the phenomenon have so far emerged in the available literature (Garriga and Melé, 2004; Kakabadse et al., 2005; Lockett et al., 2006; Baron et al., 2011; Perez-Batres et al., 2012). The lack of consensus towards CSR largely owes to the apparent controversy, or paradox, of meeting the economic imperatives of private firms vis-à-vis the societal and environmental goals aspired by individuals (Friedman, 1970; Campbell, 2006; Cosans, 2009). To that extent, the present paper attempts to contribute in that debate by shifting the focus of discussion towards the market for CSR actions and activities. Analysis adopts an institutional approach under the premise that a more integrative approach to understanding the complex nature of the phenomenon might be provided via the synthesis of stakeholders’ incentives and roles realized in the market terrain. In that sense, the paper proposes an identification of the demand and supply forces interacting in the market for CSR practices and examines the ability / strength of these forces to support close to, or far from, competitive equilibrium outcomes, i.e. welfare enhancing market outcomes. The validity of the proposed context to analyze CSR practices and actions is tested via a tentative application to the, admittedly extremely complex, food sector. The implications of such an exercise are important. As regards the CSR research agenda reorientation, initial evidence is provided of the need for more academic research and analysis over the exercise of CSR power and control among societal institutions such as the state, on the one hand, and the markets, on the other. This need is even more important when research relates to the considerable economic, social and environmental dimensions of the food industry.